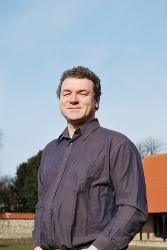 Tectonic Pate » Our local LibDem PPC. The geekiest guy in politics? Our local LibDem PPC. The geekiest guy in politics? Looks too young to have been mayor, surely? Forget briefing notes left in the back of a taxi. I love the fact that our local Liberal Democrat PPC is cavalier enough to leave stuff like this lying around on the internet. It’s the personal homepage of James Doyle, Freelance IT consultant, ex-mayor of Worthing and now facing off against Tony Benn’s grand-daughter Emily Benn for the non-Conservative vote in East Worthing and Shoreham. It’s an odd constituency, taking everything from hulking council estates and utterly failed schools through an extraordinarly affluent commuter belt and the Lancing school right down to the community of houseboat dwellers on the opposite bank of the river to me. It’s a fairly safe seat for the Conservatives – the incumbent has been there since it was created in 1997 – but I really hope Doyle can make the most of the LibDem swing and win it. I’ve never been a fan of Magic the Gathering, but I have nothing but respect for a grown man who can be a prominent local politician and have actually coded an app for it. I have no idea what the app does, and it looks enormously dull, but I’m sure it’s important to Magic players. 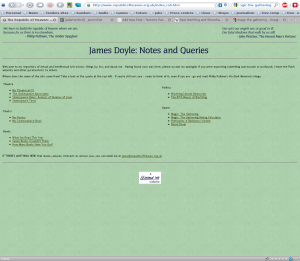 James Doyle's homepage. A truly old-school geek. Plus, he plays Diplomacy. Which I used to love. How does he find the time? And he writes poetry. Which makes me want to quote Douglas Adams. But I won’t because that would be cruel.